Refreshing, tropical splendor. Photo courtesy of Roost Books / Shambhala Publications, Inc.
Gentedimontagna contributor Christine Chitnis recently authored , a health-conscious, lactose-sensitive recipe book of summery treats. We like the sound of frozen smoothie pops that taste like a beach day in the tropics. When it comes to getting my daily greens, I'll try just about anything. I love big, crunchy, straight-from-the-garden salads, but I also love blending produce for smoothies. 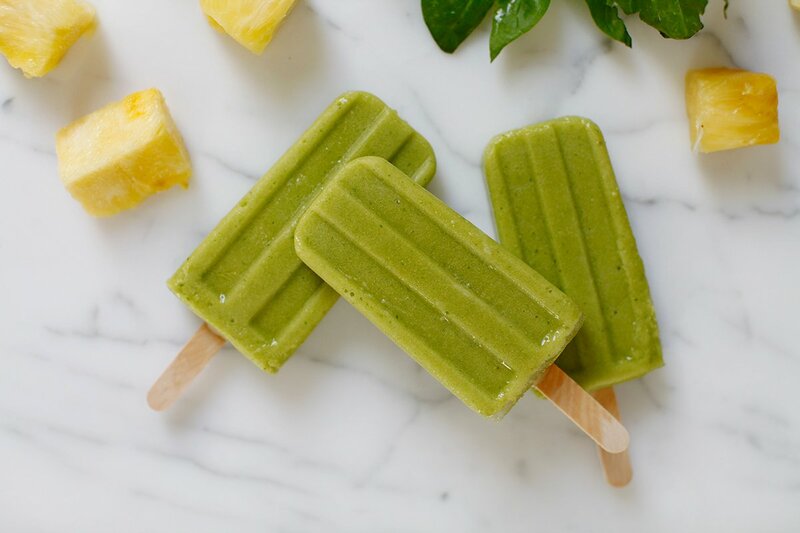 Sweet, creamy, and refreshing, a green smoothie works in ice pop form. The recipe is simple, great for summer, and lends itself well to experimentation. I like spinach for its subtle taste, but Swiss chard and kale also work well. I love the sweetness of freshly made pineapple juice, though you can substitute ready-made juice too. You can also toss in your favorite fruit or whatever you find in season at your farmer's market. If you're serving to kids, play up the green color and they’ll be slurping daily servings in no time. 1. Put chopped pineapple chunks through a juicer. Measure 1 cup of pineapple juice (or use store-bought juice). Add to blender with bananas, mango, coconut milk, and baby spinach. Blend until smooth. 2. Pour smoothie mix into pop molds, insert sticks, and freeze for 3 to 4 hours until hardened. From by Christine Chitnis, © 2016 by Christine Chitnis. Reprinted by arrangement with Roost Books, an imprint of Shambhala Publications, Inc., Boulder, CO.
Christine, an author and photographer, lives with her husband and sons in Providence, RI. Her latest book, Icy Creamy Healthy Sweet (Roost, April 2016) features 75 recipes for dairy-free ice cream, fruit-forward ice pops, frozen yogurt, granitas, slushies, shakes and more. Visit her at christinechitnis.com, anf follow her on and @ch_chitnis.